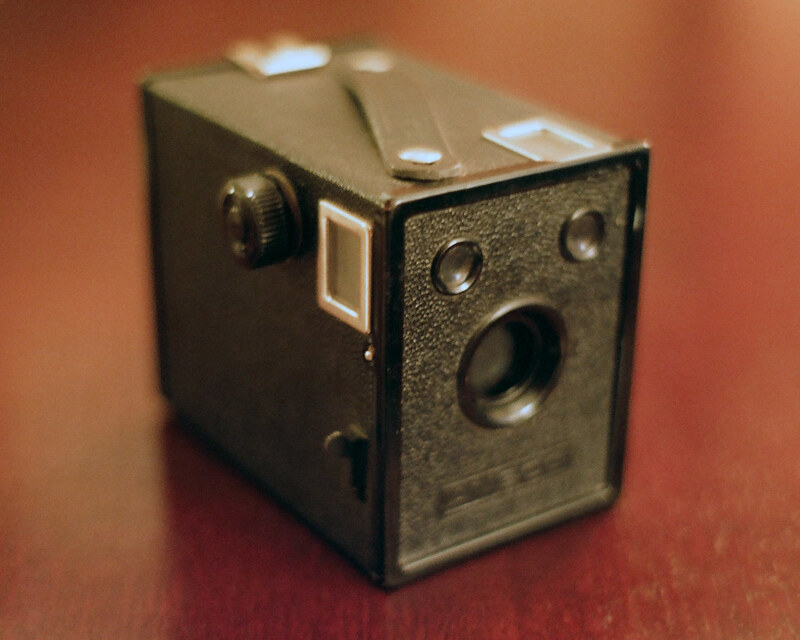 Ansco manufactured simple cameras that anyone could operate, like my Ansco Shur Shot box camera. Ansco also imported more fully featured cameras from other makers around the world, including Agfa, Ricoh, and Minolta, and rebadged them as Anscos. 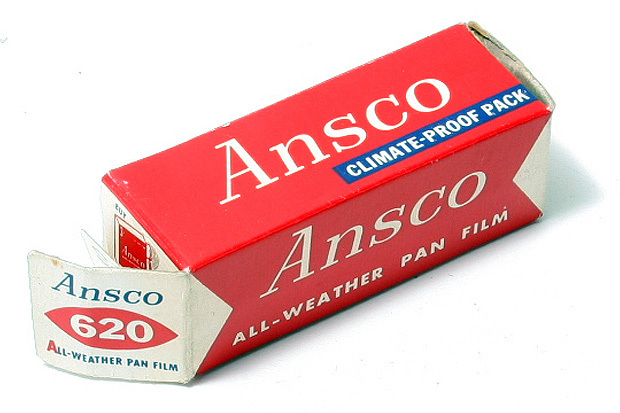 Whatever happened to Ansco? Well, in 1967 it began to favor using the name of its parent, General Aniline and Film, or GAF. As GAF, it stopped making cameras, instead selling GAF-branded cameras that other companies made. 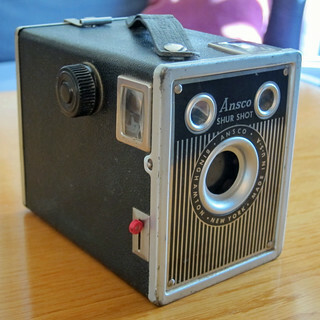 By the late 1970s, the Ansco brand name was sold to a Chinese camera maker. You could buy Chinese Ansco film cameras through the 1990s. Vintage TV is an occasional series. See all of my Vintage TV posts here. I found some photos I took with a few of the old cameras I had and thought I’d share a few of them. Here’s a photo of my bike and my old friend Brian’s bike, taken in 1981 or 1982 with my Kodak Duaflex II, a fixed-focus twin-lens-reflex camera, in the driveway of the home where I grew up. I remember buying this 12-exposure roll of Kodacolor II film a few blocks away at Hans-Burkhart Pharmacy for way more than it would have cost to put a 24-exposure cartridge into my Instamatic. I didn’t mind the cost when I found that the camera was a pleasure to use — it was easy to frame subjects through the huge fish-eye viewfinder, and the shutter button was buttery smooth. The photos all came back bursting with color, with the subjects crisp and the backgrounds just out of focus. I took my Argus A-Four (or, as it reads prominently on the camera, argus a-four) on our annual Camp Grandma trip in probably 1981 and took some photos of life around the lake. Taking a photo with this camera required some forethought since the shutter had to be cocked and the shutter button itself sometimes worked loose and needed to be tightened. At least the viewfinder was clear. Here’s a photo of my brother jumping off the well pit cover in front of my grandparents’ palatial retirement estate. I think I was using cheap store-brand film. I must also have used super cheap developing because these prints darkened quite a bit. Paint Shop Pro 7 restored this print reasonably well, though in real life the gold trim on the palatial estate was bolder. When I learned that my working Ansco box camera (ca. late 1930s) took film that was still available — good old 120 roll film — I was pretty excited and wanted to try it out. My then-fiancee was a professional photographer and gave me a roll of Plus-X to run through it. I think she rolled the film herself, and then she developed it for me. It was very cool. It was difficult to frame photos with this camera because the viewfinder was very small and cloudy. The prints turned out pretty well except for a slight haziness, which you can see in this photo of her cat Charlie. He was on the hood of my car only because the driver’s-side window was closed; otherwise, he slept in the driver’s seat all the time.